Building fine motor skills is an important part of any child's development. Children use fine motor skills whenever they engage in play involving their hands and fingers, such as dressing up dolls, construction toys, and beading. Children also use fine motor skills for many self-care tasks such as doing buttons, tying shoelaces and eating with cutlery. However, not all fine motor activities are good for building fine motor skills - some activities just leave kids feeling frustrated because their skills are too poor to complete the activity successfully. 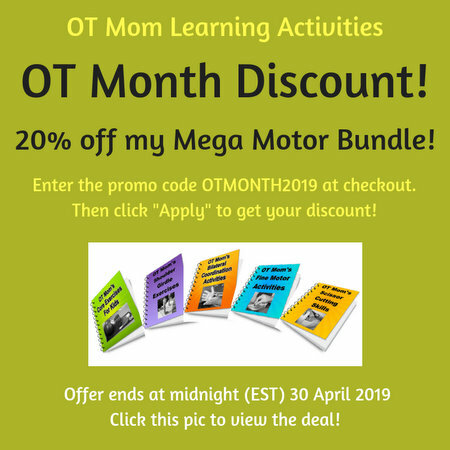 These OT Mom E-books contain a wealth of carefully selected fine motor activities that will help your child to develop their skills with confidence. Most of the activities use resources that are inexpensive and easy to obtain. All the activities have photographs so you can see exactly what I am suggesting. 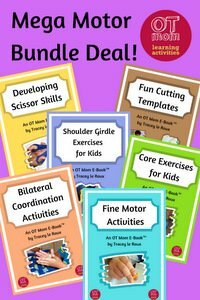 I have created the scissor skills e-book separately from the main fine motor e-book for those who just want to work on scissor skills. However, if your child's fine motor skills are poor, I really recommend that you get both, as scissor cutting is an integral part of building fine motor skills. 22 pages of additional information, including shoulder girdle and core exercises, bilateral coordination exercises and more! For a more detailed breakdown of the contents, please click on the e-book image above. The scissor cutting skills e-book comes with a free Bonus Cutting Template download that includes lines, basic shapes and some fun cutting activities. For more details regarding this e-book, please click on the e-book image above. 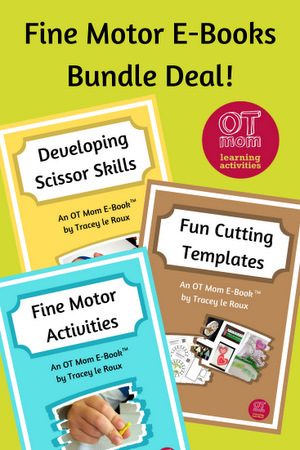 Get A Head Start On Building Fine Motor Skills With These Great Bundle Deals! Head on over to my Discount Deals page to get these great bundle deals! If you have stumbled upon this page by accident, you may be wondering why my e-books are not free! I cannot afford to maintain a website of this caliber without a source of income. However, I have kept the prices as low as possible. I invite you to explore my website pages to find free activities or a sample of what I offer. If you desperately need more than that, and genuinely cannot afford to purchase an e-book, then feel free to contact me to explain your situation.